A new Web resource - HealthReformVotes.org - is offering voters a convenient tool for making an informed analysis of their elected officials' stance on health reform issues. The online resource reveals the votes of every member of Congress on key health care votes - including the Affordable Care Act - while offering an explanation of what was in each of the bills. HealthReformVotes.org offers voters a convenient tool for making an informed analysis of their elected officials' stance on health care-related issues. This tool clearly shows not just what a member of Congress promised, but how he or she voted on a collection of Congressional bills. If results of a recent national Gallup Poll are any indication, Americans who vote in the upcoming general election will definitely give consideration to the way their member of Congress voted on health care legislation, and in particular, the landmark health reform law, the Patient Protection and Affordable Care Act - or "Obamacare," as it's sometimes labeled. Now, a new Web resource - HealthReformVotes.org - is offering voters a convenient tool for making an informed analysis of their elected officials' stance on health care-related issues. The online resource reveals the votes of every member of Congress on key health care votes, while offering an explanation of what was in each of the bills. Charles Smith-Dewey, creator of HealthReformVotes.org, says that for many voters, the site will be a clear reminder of votes on the health reform law, but also a deeper look at a politician's words and votes on a range of health care legislation over time. "Every elected official naturally will claim that he or she supports legislation that will improve Americans' access to affordable health coverage and health care," says Smith-Dewey. "This tool clearly shows not just what a member of Congress promised, but how he or she voted on a collection of Congressional bills." One glance at an elected official's profile will reveal a clear pattern of voting - and that's important, Smith-Dewey says. "Voters want to know whether their representatives were consistent in their votes. But also, were those votes consistent with their personal views, or were the votes simply along party lines? Was your member of Congress willing to cross the aisle?" In addition to the actual voting records, the site offers analysis of each bill, explaining why the legislation was supported or opposed. "It's an important tool for voters who are hearing a lot of heated rhetoric in the media right now," says Maggie Mahar, a prominent health care blogger and author of "Money-Driven Medicine: The Real Reason Health Care Costs So Much." "Polls show again and again that people are still sharply divided on health reform," Mahar says, "but polls also reveal that most people are confused about what is in the legislation." "Fear mongers have polluted the media with so much misinformation," Mahar says. "For example, most people do not know that the legislation will lower the cost of healthcare for middle-income Americans who don't have employer-sponsored insurance. And most seniors don't realize how the legislation will strengthen Medicare." Mahar was one of a handful of health care journalists who provided background on the legislation tracked by the site. The site provides the "big picture" on legislators' health reform voting records, but also provides a one-stop resource for "getting to know your member of Congress," Smith-Dewey says. Information-packed profiles of every U.S. Representative and U.S. Senator include links to each legislator's Facebook page, YouTube page, official Congressional biography, personal web site, data from OpenSecrets.org, VoteSmart.org, and health reform-related video excerpts. And for site visitors who have additional questions or comments for members of Congress, each profile on the site also includes mailing addresses, phone and fax numbers and email submission functions. 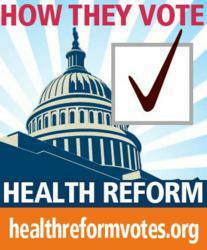 HealthReformVotes.org is a special project of the Health Insurance Resource Center. Published since 1994, the Health Insurance Resource Center is the Internet's longest-running independent source of consumer information about affordable health and medical coverage.